Summary: This compact home gym from the respected Marcy gives you the opportunity for a wide variety of workouts, ideal for both the home and garage. Built to last, this impressive setup is sure to get you in shape. Excellent feedback, a nice discount (*at the time of writing) and free UK delivery on offer at amazon.co.uk – check the product page for more on this and to see the full (impressive) picture gallery. The Marcy Eclipse HG3000 Compact Home Gym can give you a complete workout, all in the comfort of your own home or garage. 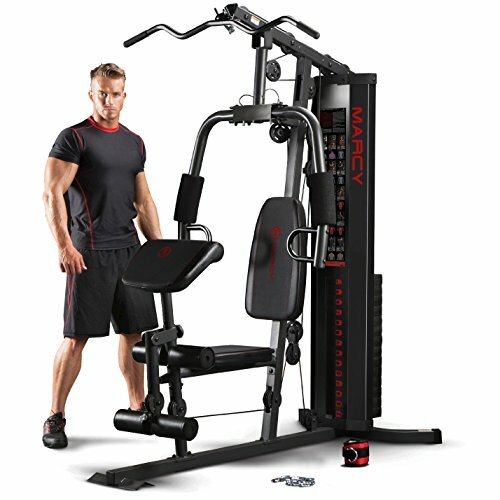 This mid-price machine allows you to practice a large variety of workouts that will work all parts of the body, the heavy gauge steel frame giving the home gym the dependable and durable feel that Marcy have become so well known for. The HG3000 features a high pulley system with a lateral bar, a low pulley system with a straight bar, leg extensions with foam rollers for added comfort, a dual function chest press and pec dec combination. It also features a weight stack of 150 pounds (68kg) with a selector pin, making weight variation particularly quick and easy. The home gym uses 2000lb tensile aircraft cables for long lasting use. This home gym looks particularly impressive in a bold black and red colour scheme. There are home gym systems which you can purchase at a lower price, but the solid and durable nature of this setup is well worth the additional initial outlay, as you’ll know this is built to last. With a width of just 91cm and a length of 172cm, it won’t take up too much room either. The number of reviews for the item is somewhat limited (as you’d expect from a mid-price gym), the reviews there are show that users are particularly impressed, every reviewer giving the machine the maximum five stars. The assembly of the item was understandably said to take a while, one stating four hours, while another said it took two of them a day, but the instructions were said to be extremely clear. Excellent, super and great were all adjectives used to describe the home gym. For the ultimate home work out, the Marcy Eclipse is the ideal machine. You’ll find a great variety of different training options, while the sturdy setup ensures that this will be your workout station for many years to come. Check out the dedicated product page now for the picture gallery, feedback and the latest amazon.co.uk discount.